All-inclusive three day riding trail. Trails in Mallorca. Day 1: We leave the stables after tacking up our horses between 9 and 10am. Our bags go on ahead by minibus, whilst we begin our ride across the plain towards the Tramuntana Mountains. 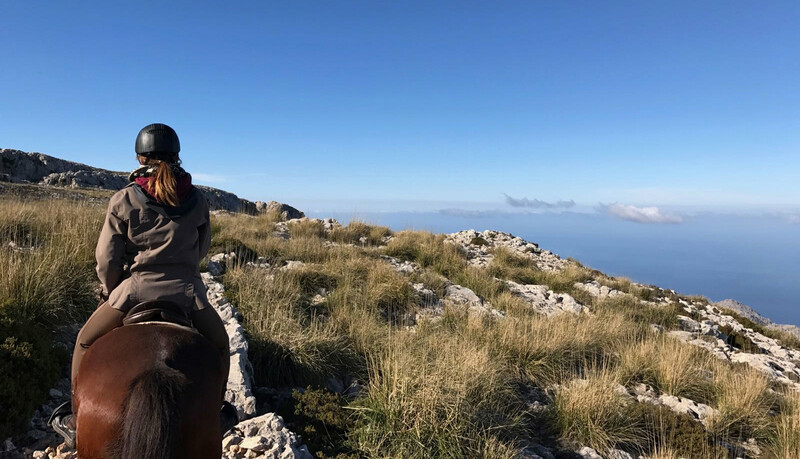 After an hour we begin to rise quickly passing with long canters, through almond and olive groves with views of the golden villages of Mallorca in the distance. We pass by Campanet and arrive in the pretty town of Caimari (the olive oil capital of Malllorca) where we stop for a typical Mallorquine lunch. After lunch we set off to reach the Piedra en Seco, an ancient pathway which was used by the ice men to bring ice into the towns and villages from the ice caves on the highest mountain peaks before the invention of fridges. We rise then, first through woodlands of pines and oaks, with charcoal making platforms and limestone kilns, to reach a high pathway with breath-taking views across the north of the island. Before the light begins to dim, we see the wonderful monastery of Lluc in the distance, where we find warm comfortable rooms waiting for us and an excellent dinner. Day 2: After a good breakfast on the second day, we set off into the high Tramuntana and soon find ourselves beginning our journey across what feels like the top of the earth. 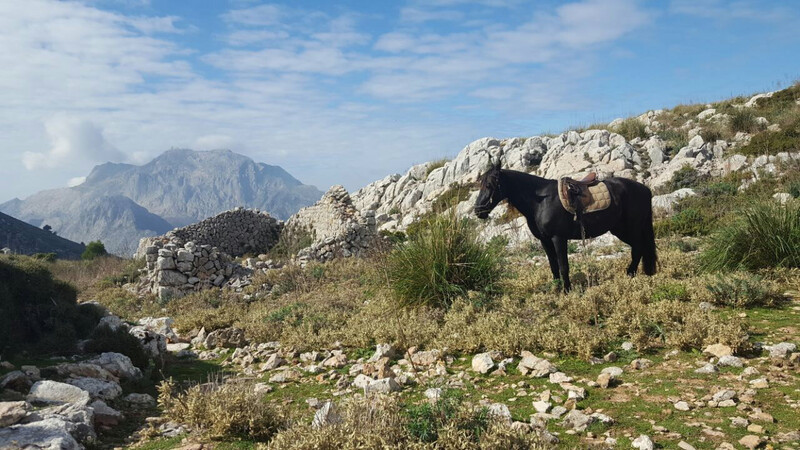 You will be amazed at how your horse tackles the rocky paths and steep mountain climbs. The views are amazing and the landscape changes from the pastoral to the austere. We often see eagles and the island’s famous black vultures as we ride. We visit the huge Galilea Ice Cave before stopping on a sheltered plateau for hot drinks and a snack. We continue to a higher point where you can see the sea below on both sides of the island and then back down towards Lluc through a wide sheltered valley and finally a wooded track towards a late lunch taken near the monastery. Then there is some free time to explore walks from the monastery, the chapel, the botanic gardens, the visitor centre, the museum and the shop. We have a late dinner. 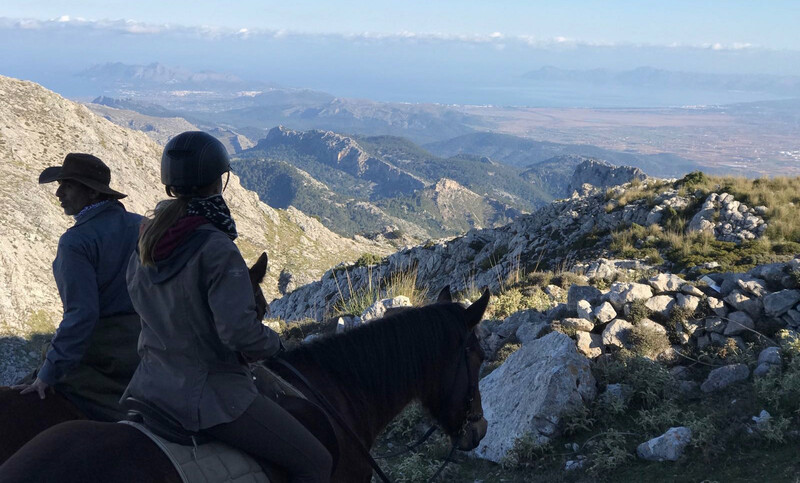 Day 3: After breakfast we ride down towards the beautiful town of Pollença on the old pilgrim track from the town to the monastery. At first the decent is steep through enchanted woodlands with silvery stones and then more gradual as we reach the side of the riverbed running down from the mountain to the sea. It is a pretty and gentle landscape in contrast to grandeur of the previous day. 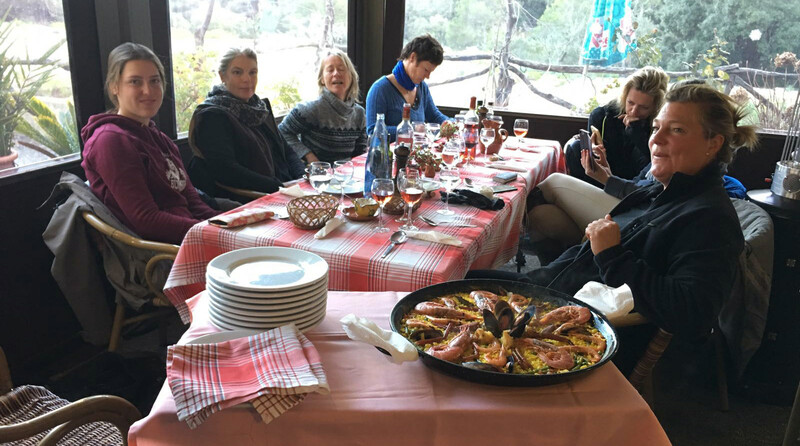 We picnic for lunch by the river and continue along flat tracks with some canters into Pollença to the old Roman Bridge, where we say goodbye to our horses, taking with us all our memories and leaving only hoof prints. The horses return by horse box, while we have coffee and cake. Trails begin at Hipica Formentor and ends in Pollença. All meals, water, table wine, soft drinks and tea or coffee included, other drinks can be bought if desired.